Making our own compost is time consuming (but great exercise!). In the first post in this series “How to become an organic farmer, part one…” we told you about the beginnings of our journey from being chemical farmers right through to becoming certified organic. Having just had our annual audit, we thought it was timely to fill in the backstory about why we think organic certification is the way to go. If you’ve ever been audited for anything, you’ll know it’s not always an easy process (read about it in this post “From the archives – our annual organic audit” ). We have to comply with all the relevant bits of the Australian Organic Standards, which for us is mostly about what inputs we’re allowed (and not allowed) to use. There’s a long list of prohibited inputs – all the nasties we would never dream of using! Slightly more complicated is the fact that anything we do use must be on the approved list. We also have to submit an updated Organic Management Plan and farm map each year. It sounds complex and stringent, doesn’t it? However, there’s really good reasons for all of it. Organic growing is based on building natural soil fertility, so we’re not allowed to use anything that might in any way destroy or interfere with the soil microbes that a natural system relies on. Chemicals and artificial fertilisers are the obvious culprits, but it goes right down to the detail of not using seaweed extract that is too high in nitrogen, for example, because it will mess with the natural balance of microbes. Our produce is always labelled with our NASAA logo and certification number (whether we’re selling it at an accredited Farmers Market or at the wholesale market), as well as the name of each variety. On top of that, we’re obviously not allowed to use anything that will harm human health, or harm the environment. But what a lot of people don’t realise is that the certified Organic Standards also dictate the ethics of every aspect of organic farming practices, which not only covers the obvious animal welfare considerations, but also things like where the liquid fish we use is from (it must be from a sustainable source). And then there’s the paperwork. All our produce needs to be traceable from the consumer, back through the retailer, the wholesaler, our packing shed and right back to the orchard. 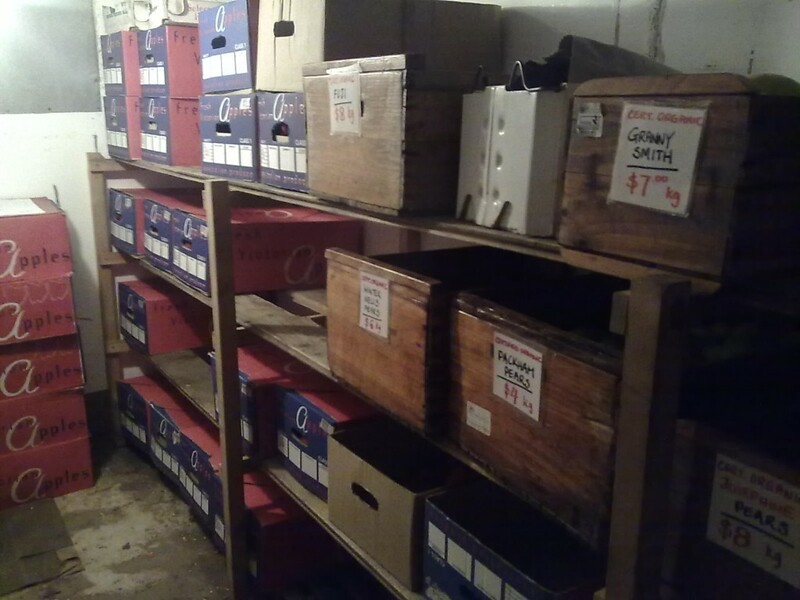 So our auditor needs to see our harvest records, our sales records and our invoices. As part of the process they choose one of our products at random, and ask to see both harvest and complete sales records for that product. They’re making sure they match, because if we’re selling more than we’re growing, there’s a problem! 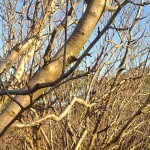 Putting double-sided sticky yellow tape around the base of each tree is time consuming, but a great way of preventing some pests (like earwigs) from damaging the fruit, without needing to use any insecticides. Certified organic food is much more time consuming and expensive to produce, and customers are willing to pay that higher price for the guarantee that their food is safe, free of chemicals, and rich in nutrients. We put compost around each tree when we plant them, and then top it up again each year. What a terrible breach of trust to be selling food containing pesticides, fungicides and other chemicals to unsuspecting customers – especially if they’re on an organic diet because they’re sick, immuno-compromised or have decided to feed their kids an organic diet. It’s hard enough to avoid chemical contamination of our bodies from environmental contamination without tricking people into eating the very chemicals they’re paying to avoid. Chickens can be great warriors against pests in an orchard! Certification is invasive and time-consuming, but this is how NASAA guards against unscrupulous operators buying chemically produced food, and reselling it (at a much higher premium) as organic. Does it happen? Well occasionally, yes! In 2007 there was a well-publicised case of an egg producer who was discovered (through the auditing process) to be buying cage eggs and reselling them as organic. They lost their organic certification and got a hefty fine! Certification is not a perfect system, and has its critics, which has even led to an emerging brigade of self-styled “beyond-organic” farmers (we’re not sure what the implication is there, but it seems to be that they simultaneously reject certified organic and claim their farming system is better). 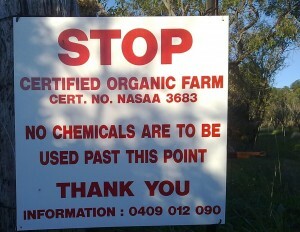 Again, they may well be following at least the minimum organic standards, but you just have to take their word for it. One of the major criticisms of the certified organic process is that it’s possible to rort the system, and of course it is if you try hard enough (though, as we saw with the egg producer, it doesn’t always work and there are big penalties if you get caught). Critics also imply that a lot of organic producers practice “shallow organics”, where they do the absolute minimum to get certified organic status, without really developing the healthy soil culture that organic production relies on. Organic growing is all about building healthy soil. Healthy trees growing in biologically active soil are much less likely to attract pests, so finding harlequin bugs on our plums is a trigger to pay more attention to improving our soil, rather than a trigger to use an insecticide! These criticisms are no doubt valid to some extent, and we absolutely agree that the organic industry (and all the farmers within it) should always be striving to improve their practices and improve the certification system. But it’s also important to find the right balance between bureaucracy and letting people get on with things! Tightening the system even further would put an ever bigger burden on organic producers, whilst farmers using chemicals are under no obligation to tell you which chemicals or GMOs (genetically modified organisms) are on or in their food as long as they are within the law regarding chemical use, residue limits, and withholding periods, and they also have to have a chemical users certificate, but who’s checking? We reckon it should be the other way around! Farmers who use chemicals should have to carry the burden of certification, and of telling the public exactly what they’re eating by labelling their product with every chemical they use. It’s not likely though is it, when such a system would rely on honesty and trust. No, the system we currently have is the most reliable way you currently have, as a consumer, to control the amount of chemicals that go into your body. And even though it can be pedantic, time-consuming and invasive…in fact, it’s really not a big deal for us any more. We know we’re doing the right thing, so as long as our paperwork is up to date (which sometimes happens the night before the audit…), there’s nothing to worry about and the whole certified organic process is not only simple, but quite affirming as well. One of our wwoofers, Kan, putting mulch around young cherry trees. Chemical orchards kill the weeds around their trees with herbicide, which upsets the natural soil fertility. We use a variety of more time-consuming methods – like mulching and mowing – to control weeds. So that’s why we stand firmly by the certified organic system, and proudly display our NASAA logo, because we reckon it’s the best security we can offer you! Next time you’re shopping and see a sign saying ‘organic’, ask the seller who they’re certified with! Last week we had our annual organic audit by NASAA (National Association of Sustainable Agriculture Australia), our certifying body, and as always, it got us thinking about why we bother going through all the palaver. Don’t get us wrong – we’re huge supporters of organic certification, and we’ll tell you all about the reasons why in our next post. We just question a food system that requires organic producers to carry the burden of proof that we’re doing everything by the book, while chemical farmers have no obligation to tell their customers anything about how their food is produced! But first, here’s one from the archive about our audit in 2011, to share the audit experience with you. Sorry about the quality of the photos – phone camera technology’s improved a lot since then. Hope you enjoy it! All certified organic producers are audited every 12 to 14 months to ensure we comply with the Organic Standards, a comprehensive document that regulates every aspect of our business to ensure we maintain the high standards required to qualify as an organic producer in Australia. We started the audit with a farm walk, showing Plamen (the inspector) the whole farm, including all the orchards and our boundaries; we have the Mt Alexander Regional Park on the east border (as you can see in the photo above), open farm land to the south, a disused quarry to the north and a mix of open pasture and a small patch of conventional orchard to the west. 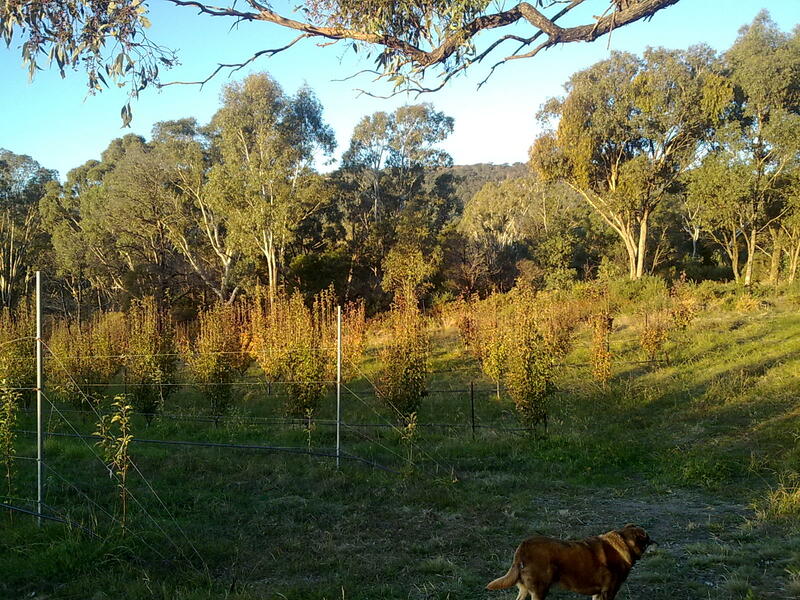 (NOTE 2014: this orchard has now gone). Some of the things Plamen asked about while we were walking around included how we control our weeds, the weed mat we’ve used in the new orchard and the types of ground cover plants we have in the orchards. 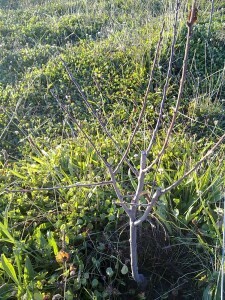 Before we planted the new orchard (including this happy baby plum tree in the photo above), we sowed a green manure crop, and we’ve been happy to see the amount of clover and herbs that have come up. These plants help to provide the trees with free nitrogen from the air, and other minerals that the plants mine from the ground. Plamen had a good look at the trees that form a buffer zone between us and our neighbours, and the signs erected at our borders to alert visitors to our organic status. 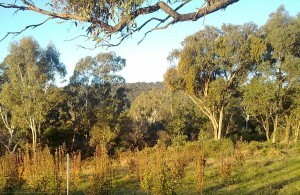 We explained that we prune the trees in the buffer zone differently to trees elsewhere on the property, to make them bushy and leafy as you can see in the photo below, to create an effective spray buffer. We don’t have a fence, just several rows of this variety of plums (President), which are NOT certified organic because of the spray drift. They’re kept completely separate from all our other fruit, and sold separately through the conventional wholesale market. The packing shed (NOTE 2014: it’s good to be reminded of the bad old days of the old packing shed – eeek! Hard to believe we managed in such cramped quarters for so many years!). We showed Plamen our packaging materials, and explained how we transport fruit to our various markets. Next we had a look at the spray shed, with lots of questions about the contents of each shed, cleaning schedules, cleaning materials and our harvest, storage and packing systems. 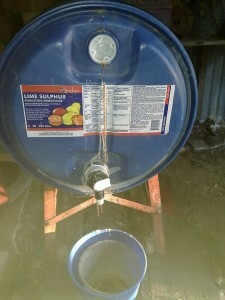 An explanation of the contents of the spray shed took a while, as each input that we use on the orchard (such as lime sulphur, calcium, fish hydrolysate, kelp and humic acid) must be individually checked to make sure it’s an organically allowable input. 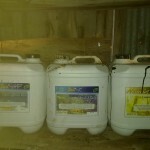 We have to supply details of each farm input so NASAA can be sure we’re not introducing any contamination into the farm. Once the outdoor infrastructure had been inspected, we retired to the warm kitchen for a cuppa and to do the paperwork. First, we went through our updated Organic Management Plan, which is sent to us before to the audit, and is our chance to let NASAA know of any changes we’ve made to the farm since our last audit. This year we told them about having planted the new orchard containing 1,000 apricot, peach, nectarine and plum trees, as well as a minor change to the way we input harvest records into our accounting program. 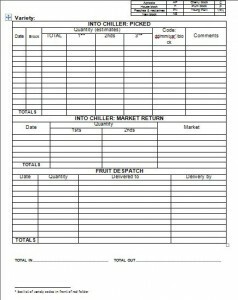 We supplied information about the size of our harvest (broken down by type of fruit), and the value of the crop this season, and provided examples of our harvest record book (see above) and our marketing records. Whenever we pick (most days during the fruit season), we record the date, variety, number of kilograms and which orchard it came from. Once the fruit has been packed we also record the number of first grade, second grade and third grade fruit. Once packed, the fruit then goes off to a variety of markets – the wholesale market in Melbourne, our various weekend markets or sent off by courier for the online sales, all of which get recorded on our different sales records and then recorded into our financial software. NASAA needs to test that the producer can track their produce from the point of sale, right back through the system to harvest. It’s important to be able to prove that we are not selling more of any one type of fruit than we are growing, as that would raise the question of where the extra fruit had come from. This is one of the ways the certifying bodies prevent misuse of the certification system; otherwise it would be possible to use the cover of organic certification to sell conventional produce as organic. 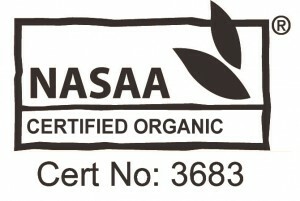 All certified organic products in Australia must carry the logo of the certifier (here’s our label), and the use of these logos is also strictly controlled. As a shopper buying anything organic, check for the logo and the word “certified”–anyone can label something as “organic”, but only producers and manufacturers that have been through the rigourious certification process can use a “certfiied organic” label. Clearly organic certification in Australia is a comprehensive exercise, and is one which can give us all confidence in the organic produce that we buy! One of the highlights of last weekend’s Harcourt Applefest was hearing the farmers’ stories at the Meet the Farmers forum. We were lucky enough to have three well-respected local farmers come and share their highlights and lowlights with us. We know first-hand how hard farming can be, but also how rewarding it is when everything goes well! But beyond that, farmers often seem to feel a deep and unexplainable attachment to their land that keeps them going through some of the hard times, and it was intriguing to hear each of them express those deeper feelings. All three were asked about a typical day on their farm in their busy season, and Carla left everyone feeling exhausted and in awe of the amount of work she and her partner Anne-Marie do during the kidding season, when the day starts at 4.30 am with the first milking of the day, and proceeds through myriad jobs until the final checking of the new mums late at night, before getting up and doing it all again the next day. 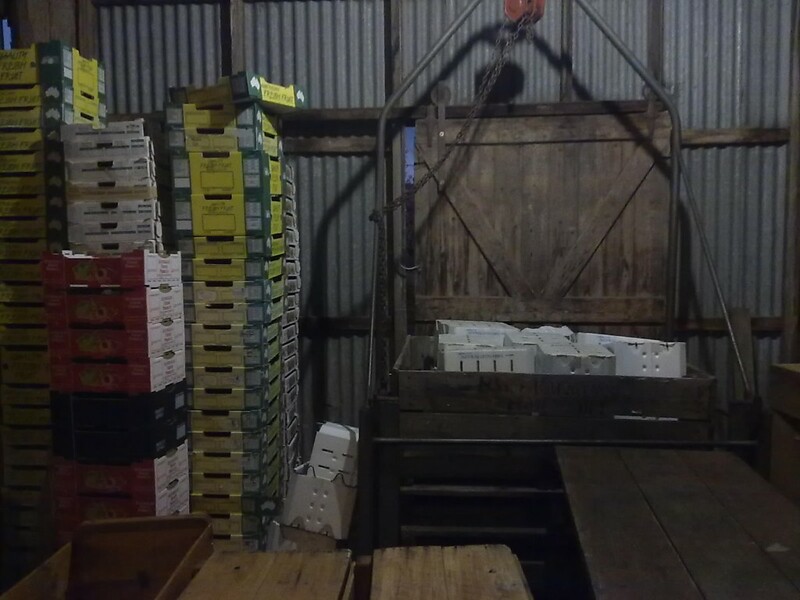 Ken’s day was also extremely full (though it didn’t start quite as early), and he described the amount of detail involved in organising pickers and getting the grapes into the shed in good condition, while at the same time keeping on eye on numerous batches of fermenting wine. Rob’s equally demanding day involved keeping track of the thousand details that growers hold in their heads during the picking season – making sure pickers are organised and kept busy all day, bins are in the right place at the right time, fruit all ends up in the coolstore by the end of the day, and all the appropriate paperwork is done. Phew! It was fascinating hearing how each of the farmers has approached some of these challenges. Carla’s main focus was on the reduced rainfall they’ve experienced at the farm, and how hard it is to keep a good feed supply for the goats when the grass doesn’t grow as well as they’d like. Farming in a dry environment, that is likely to get even drier as we feel the effects of climate change, has led to innovations in planting alternative food crops for the goats, a strategy that is working well at the moment and still has plenty of potential in future years. Rob spoke of the pain of losing apples to both hail and marauding birds, a situation that prompted he and his brother Trevor, with whom he farms, to make a large investment in netting and equipment last year. Ken’s biggest challenge has been the frustration of years of coping with the drought being followed immediately by the wettest year on record, and all the issues that led to in the grape crop. The forum ended with each farmer explaining why they do what they do, and what they love about it, and this was where they really came alive! It was very special to hear them speak with absolute pride about their product, as well as describing a strong sense of belonging to their land. Carla’s description of the sounds, and look, and feel of her farm on a crisp winter morning when she heads out from the house to the milking shed, and then being warmly greeted by the goats, was absolutely beautiful. For both Ken and Rob, knowing that their produce is enjoyed by people throughout the whole of Australia was a source of tremendous pride to them, and constantly pushes them to do better, learn more, and achieve an even better result for their customers. There is something very touching about hearing farmers, who are often quite sparing with their words, struggle to find a way to express how they actually feel about what they do, and what keeps them doing it! It was an absolute privilege to share their stories.